In Silver Linings Playbook, director David O. Russell’s unhinged and fearless romantic comedy, Bradley Cooper plays Pat Solitano, a Philadelphia school teacher recently released from an eight-month stint in the psych ward. Pat’s bipolar condition has cost him his job, his house and his wife. But he’s determined to make things right as he moves back in with his parents, played by Robert De Niro and Jacki Weaver. Silver Linings Playbook has the overall shape of a traditional romantic comedy, but inside those lines it plays by different rules entirely. Director Russell (The Fighter) builds his scenes around twisty, swerving arcs of dramatic tension and comic energy. His inquisitive camera moves willfully, lingering on odd details. Russell coaxes vigorous performances out of the cast, too. Lawrence is particularly impressive, suggesting worlds of hurt beneath her feisty Philly girl act. Probably the most surprising thing about Silver Linings Playbook is how relentlessly funny it is. The dialogue is rooted deeply in character—you’ll find no rom-com one-liners here. As such, the laughs arise with organic force, triggering that slightly out-of-control quality that can manifest in genuine fits of hysteria. You know the feeling when you literally can’t stop laughing? And how that’s a little scary? Pat and Tiffany live like that all the time, in their manic phases, and they get the can’t-stop-crying thing too, when the pendulum swings back. The film’s great accomplishment here is conveying that feeling to the audience. Silver Linings Playbook is romantic comedy cranked to 11—reckless and satisfying. As evidenced by all the October cable movie marathons, Halloween season is the time when people like to watch scary movies. I tend to watch an inordinate amount of scary movies myself, for reasons I probably don’t want to know. It’s no secret that horror films are often reflections of cultural anxieties, and many a Ph.D. thesis has been written on aspects of the topic. As we discussed a few weeks back, NBC’s new drama Revolution directly confronts our worries about energy, and what happens when the lights go out. The series is set in a post-apocalyptic world 15 years after a mysterious worldwide blackout. There have been dozens of sci-fi movies, horror films and thrillers over the years that address – directly or indirectly – our cultural anxieties about blackouts, energy crises and subsequent disasters. Here’s a sampling, and feel free to make your won recommendations in the comments field below. This Halloween, forget about ghosts and vampires. Go for the really scary stuff. Probably the granddaddy of all Big Energy anxiety movies, The China Syndrome is named after a gallows-humor term describing a nuclear power plant meltdown that burns into the earth, clear through to China. In the film, Jane Fonda and Jack Lemmon try to prevent just such a scenario, and in a bizarre case of art anticipating life, the film was released just 12 days before the Three Mile Island nuclear accident occurred on March 28, 1979. The China Syndrome is a relatively thoughtful disaster movie that sparked a new wave of anti-nuclear hysteria when it hit theaters. Wreck-It Ralph, the title character in Disney’s agreeably goofy new 3-D animated film, is a 1980s-style arcade game bad guy in the tradition of Donkey Kong. He’s a blue-collar sort of fellow, clocking in each day to suffer ignoble defeat at the hands of the game’s goody-goody hero, Fix-It Felix. In the notional universe of Wreck-It Ralph, video game characters have their own lives outside the workaday demands of their profession. When the lights go out at the arcade, the characters travel via power cord to Game Central Station, where there’s a definite social pecking order. Old-timers like Q*bert, for instance, are reduced to begging for change. Ralph, voiced with great comic instincts by John C. Reilly, is tired of being the bad guy all the time. So he sets out to win the love and affection of the pixelated people by earning a medal in the violent first-person shoot-em-up Hero’s Duty (think Halo, Gears of War, etc.). Plans go awry, and to save the day Ralph must team with a hard-case female space marine (Jane Lynch), an anime kart-racing pixie (Sarah Silverman) and his old nemesis Fix-It Felix (the very funny Jack McBrayer, of TV’s 30 Rock). 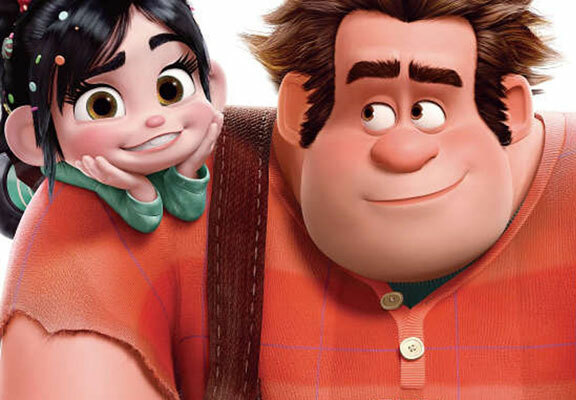 As family entertainment, Wreck-It Ralph is an entirely professional production. Everyone delivers the goods, from the writers to the animators to the voiceover performers. The jokes are solid, the 3-D technology is artfully deployed, and the actors locate the humor and heart in their characters. Veteran stand-up comic Silverman is especially nimble as our feisty heroine. As with her stage act, she has fun spiking her cutie-pie persona with mischief and sharp edges. Gamers will enjoy the wink-nudge references to arcade gaming’s 1980s heyday, while the kids will recognize more recent signifiers. Disney’s Wreck-It Ralph is final evidence, if we still need it, that gamer culture is now entirely mainstream and multi-generational. I liked how the movie plays fair within the existential rules of its own premise. Characters regenerate within their own games, for instance, but can die inside another. But the underlying story of Wreck-It Ralph is getting awfully familiar: the bad guy who turns good. We’ve been riffing on this one for a while—Megamind, Despicable Me, all the way back to Shrek and beyond. Come on, Li’l Hollywood, let’s get some new stories in the mix. Do it for the kids.